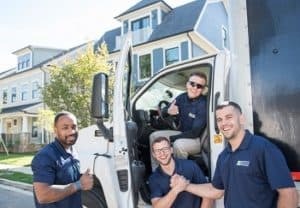 What type of Services do Movers Provide? We are a full service Pack, Move, Junk and Clean operation! Moving Services: We offer local and long distance moving services. We specialize in all sizes, from 1 bedroom / studio moves to full single family homes and town / rowhomes. We can offer overnight storage for your move if need be as well. We operate in cities and suburbs alike, don’t let our name fool you! Our Local Moving Crew will come out and likely perform your move all in one day. We will wrap all your belongings in specialized moving blankets to ensure safe transit. Whether you are moving down the block or 20 miles away, we have you covered! We charge by the hour for local moves and our pricing is very straightforward with no surprises. We are your #1 Local Moving Company choice! Long Distance Moves are flat rate moves, also with no surprises! You tell us what you have, where you are moving to and from and we will send you a no frills quote. We travel all across the United States! We offer dedicated and shared services. Certain larger van lines may be able to offer a more competitive quote, but that comes with some downside. With our dedicated service, we can perform cross country moves in just a few days. And with dedicated moves, there is no risk to lost items because of switching trucks or warehousing. Once we are finished with your load, your truck is on its way to the final long distance move destination. We are your best long distance movers in your neighborhood! We are the #1 Long Distance Movers. Packing Services: Are your kids preventing you from packing up all your belongings, or do you simply not want to deal w/ wrapping each and every wine glass? Packing up that storage area or packing your kitchen / china can be a daunting task. We can help guide you along the way with some packing videos or general tips and tricks. Our moving guide has some great ones! Download it now! If you want us to handle it, just ask for a free packing and moving quote! We can come in and box up all your belongings in one day. Our pricing is very simple. Just an hourly labor charge plus a small travel fee and you only pay for materials we use! We can have you packed up a few days before your move up to in some cases, the same day as your move. We know how to carefully box up the most fragile of items, like your grandmother’s china set. We can also arrange to have larger fragile items crated thru a 3rd party vendor. Junk Removal: Can Suburban Solutions Haul away my junk or donation items? We sure can! We at Suburban can schedule a full junk removal run for you without any moving services or we can simply take some unwanted items away on moving day. We will take what we can first to a donation center to repurpose anything in good condition. If its pure junk, we can remove them from your home and run them strait to the dump. Call today for a free junk removal quote! We charge by the volume for full scale junk jobs or by the piece for smaller add on jobs. Cleaning: Every time you move out of your place, you likely will want it professionally cleaned before turning it over right? Whether it is a rental or a sale, we can assist you. Some locations have in house cleaners on staff but all locations will at least have a recommended company and can handle all of the logistics for you! Storage: Are you in a scenario where you need time between your moves? If we can not store your items on a truck or in a warehouse, we always will have a recommendation on where to store items for a short or long term! Call today for a free storage quote!